A provocative panel at the 2017 American Economic Association meeting, featuring Professor Hansen and other senior scholars, explored the oversized role that a handful of economics journals plays in the profession. The panelists sought to respond to the growing realization that publication — or not — in just five top journals can make or break a scholar’s career. 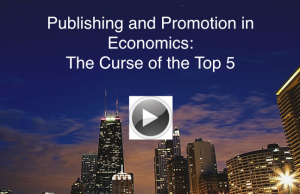 Titled “Publishing and Promotion in Economics: The Curse of the Top Five” and organized by James Heckman, University of Chicago, the panel examined this influence through data, literature review, and shared experiences. The participants discussed the extent of the impact as well as possible solutions. Hansen’s remarks centered, in part, on the challenges the dominance of the top five present to preparing and evaluating young scholars, particularly as the field becomes more specialized. He observed that if young people are being asked to become specialists in economic theory in the field of econometrics, for example, then it’s very hard for them to also become experts in economics more broadly. Hansen concludes that the “top five” is ultimately not a very useful way to think about impact in the field. “I do think finding ways to recognize creativity and the possibilities for it at early stages of careers is absolutely vital and important,” he said. Hansen’s complete remarks begin at roughly 52:20 in the above video. He is preceded on the panel by James Heckman; George Akerlof, Georgetown University; Angus Deaton, Princeton University; and Drew Fudenberg, Harvard University. The panel discussion was part of the AEA’s annual meeting, held in Chicago, IL in January 2017.